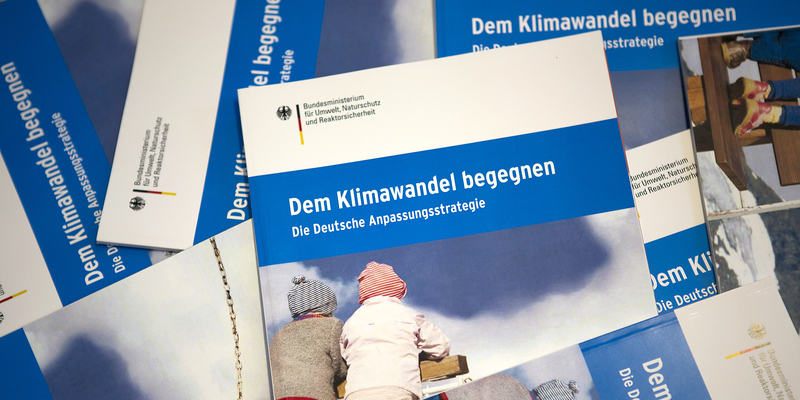 The German Adaptation Strategy provides a framework for the adaptation to climate change impacts. Climate change is already taking place today - even here in Germany. In order to avoid or at least minimise damage and exploit possible opportunities, effective adaptation measures are required. Germany has established a political framework for this by developing the German Strategy for Adaptation to Climate Change. What are the objectives of the DAS? How is the DAS implemented? In order to provide climate change adaptation in Germany with a political framework, the federal government adopted the German Strategy for Adaptation to Climate Change (DAS) in December 2008. The Strategy comments on observed and expected climate changes. It mentions steps that are necessary to implement adaptation measures in time, and thus foresightedly. The DAS presents possible consequences of climate change in various fields of action and suggests potential courses of action. Thus it provides the foundation for a medium-term process that will make Germany more resilient to climate change and its impacts. An evaluation of the available regional models for Germany and three different emission scenarios (A1B, A2, B1) by the German Weather Service provided the basis for the presentation of climate changes in the German Adaptation Strategy. Based on these results, important potential climate impacts were identified for Germany. The German Adaptation Strategy addresses regional differences in climate change impacts: Based on results of a cross-cutting vulnerability assessment, it identifies a number of priority areas. In addition, it discusses Germany’s international responsibility. Do you want to learn more about consequences of climate change and adaption in the different fields of action? With our search form “Regional and sectoral adaptation” it is possible to filter for distinct fields of action or the German Länder. Risk assessment: Together with the federal states and other social groups, the risks of climate change will be assessed. Development of decision-making bases: The combined knowledge on climate change and its consequences contributes to the development of decision-making bases by pointing out the need for action and potential measures. Implementation of adaption measures: On this basis, objectives are formulated and adaptation measures are developed and implemented. Awareness raising: In addition, the awareness of climate change and its consequences shall be raised and key stakeholders shall be made aware of their own actions. Implementation of adaption measures: With the Adaption Action Plan, the federal government highlights the objectives and courses of action referred to in the Adaptation Strategy with specific actions of the federal government and the federal states, which are continuously implemented. In addition, this field covers the funding of adaptation measures. Dialogue and participation process: A comprehensive and interdisciplinary dialogue and participation process was initiated for the development of the strategy already. After the adoption of the Strategy, this process was continued and laid on a broader base. Consequently, all key players are involved in the implementation and further development of the DAS. Pooling of knowledge: In order to provide the administration, companies and citizens with information and decision-making aids, it is necessary to have as much knowledge as possible about climate change and its consequences. The federal government supports a large number of research projects in order to expand the existing knowledge base continuously. Collecting and sharing this knowledge on the Internet platform KomPass also belongs to this third field of activity. Evaluation of strategy and measures: After the implementation of the first climate change adaptation measures, the Adaptation Strategy and the adaptation measures in the individual fields of action are to be evaluated on the basis of specific indicators. Additional information on this process can be found in the section Further Development of the DAS.